The redbelly snake is a small snake rarely more then a foot long. It is brown or gray on top with a bright salmon-red belly. This snake spends most of its time under logs, rocks, or leaf litter. It is commonly found when cleaning up yard debris and woodpiles. This beautiful and docile snake can be handled without risk. It rarely bites, and its tiny teeth are unlikely to penetrate skin. In Minnesota, Redbelly snakes mate in spring. They give birth to five to eight young in late summer, each about 3 to 4 inches long. 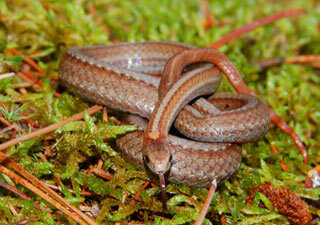 The redbelly snake is found in woodlands and forest edges often near water. It lives throughout Minnesota, including the far northeastern part of the state, which harbors few snake species. They spend winters in rock crevices and ant mounds.